We checked in late and the front desk clerk was so nice. There was a technical issue with the first room, she came back to the room walked us to another room AND made sure that everything worked before bidding us a good night. After a good nights rest, the morning clerk was also very nice, she even gave us eatery recommendations. Thanks ladies for making our stay, although short extremely pleasant! This hotel is what it is. I feel the reviews that I read prior to selecting this facility were forthcoming, for the most part, except for one key detail on which I am about to expound. The walls in this place are SUPER THIN. I went to New Orleans to hang out and sleep in. Because it was my vacation, I really wanted to sleep until at least 8/9am, and get up and go for my morning run before it got too hot. The first night, our neighbors kept their television BLASTING all night only. There's no staff on the premises at night so we had no way to request them to intervene. (The desk attendant did go to these guests the next day to ask them to turn down the television, and they did.) And for the remaining of our time here, we were awakened at the crack of dawn by the cleaning staff as they yelled to each other from one end of the courtyard to the other. Each and every morning. Before 7am. I was EXHAUSTED because of a lack of sleep by the time I checked out. So yes, please read all the reviews. But if you want to pay your hard earned vacation money for some REST, this is not the place for you. Amazing, magical...we will never forget it. Glinda was so kind and helpful and made our trip perfect! This hotel has a magical quality that only be experienced. The building is old, so don't expect the Hilton, but do expect New Orleans with perfect personality nestled in the French Quarter. The BEST! 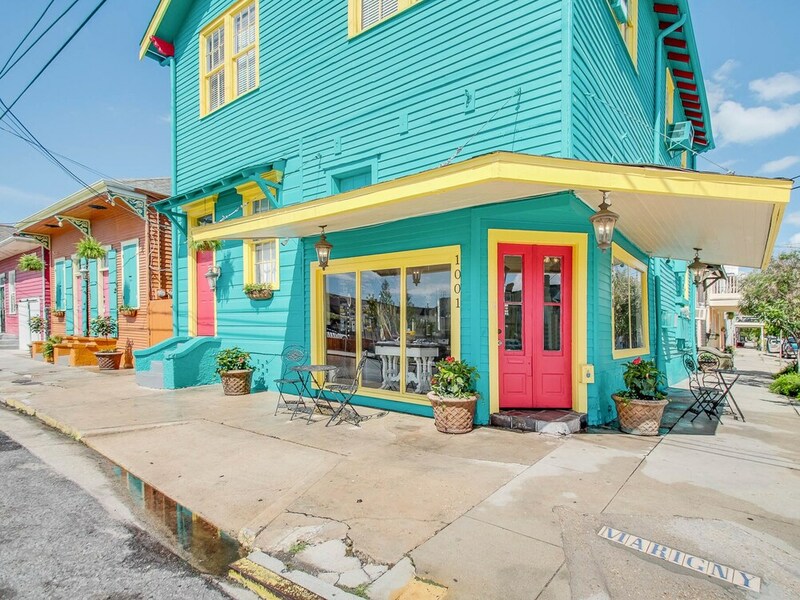 Great place to settle into, with a quiet but accessible location, with a real feel of New Orleans. old charming hotel near french quarter. good breakfast. Awesome little hidden gem of a hotel. Not far from downtown either. I will definitely stay again next time I'm in town. Nice and quiet hotel. It was less than a 10min walk to Frenchmen St. and 20min walk to Bourban St.
We were disappointed driving up as this place looked pretty sketchy. It turned out to be just fine. Staff was outstanding, very friendly and helpful. The desk attendant helped with my daughter who was feeling quite ill upon arrival; turns out he is also an EMT. Rooms are all different, most are on a locked gated courtyard (where continental breakfast is served), but ours had a separate entrance onto the street. This hotel suited us very well for a quick visit to NOLA the weekend before Mardi Gras. There was noise at all hours from the street with all of the celebration going on...random people walking by talking and singing, people riding bikes, even a random trumpeter at 3am, but it was all part of Mardi Gras and lots of fun. If you are not into frills, can tolerate a little character and are OK with being right in the heart of a real legit New Orleans neighborhood you will do just fine here. I would stay here again. Stayed here before, this room not as nice as the other. This room needs updating, bathroom in need of updating, very dingy and rundown compared to other room at hotel. Hot water and water pressure very lacking in this room compared to other. Good shower, good water pressure, nice continental breakfast. Comfortable room, clean, pleasing. We needed to crash for a night and this hotel was perfect. Interacted with multiple staff and they were all great! Bed was very clean and comfortable. Will be back! We had our flight arrive late. The check in office was closed for the night. They went above and beyond to make sure we were able to get into our room that night. They all had amazing customer service!!!! Staff was friendly. Rooms were clean and comfortable. Only a few blocks from the French Quarter. Overall very nice and a bargin. Had a great time. Great Staff, Free Parking, Free parking. Walking distance to market street and many clubs. About a 6 block walk. It new Orleans so be careful. Great location for me . Very Quant. My fiancé and I stayed at the Olde Town Inn when we were moving across the country. Our car was full of our belongings, and we were worried about leaving it in a public parking lot. When we went to check-in, the gentleman working the front desk was very friendly and mentioned that there was a private parking lot. He walked us to our room and showed us the property. We were very happy with the temperature and condition of our room. It was also a quick 10 minute ride to the French Quarter. I highly recommend the Olde Town Inn. Pros: For the price, hard to beat this location. Ease of parking and checking in fantastic. The room was very clean and was cool. Cons: Pillows and towels are as cheap as they come and don't provide much comfort. Breakfast is bare-bones, carb-heavy and leaves much to be desired - more fresh fruit would be a plus. Located in Faubourg Marigny, Olde Town Inn is within a 5-minute walk of popular attractions such as Frenchmen Street and Royal Street. This 30-room bed & breakfast welcomes guests with conveniences like a 24-hour front desk. For your convenience, a continental breakfast is served each morning for a fee. Guests can expect to find a TV with cable channels. Other standard amenities include a ceiling fan and free toiletries. Olde Town Inn features free WiFi in public areas and an ATM. There's free offsite parking if you drive. The front desk is staffed 24 hours a day to help with luggage storage and tours/tickets. We are glad you enjoyed your stay; we hope you choose to return. Thank you for the lovely review! We're so glad you enjoyed your stay,and hope to see you again soon! Thanks you for your feedback.I am so sorry to hear of the complaints you had while staying with us. We have made notes of your concerns and will continue to stride for a comfortable stay. We do encourage you to come back and stay with us in the near future. We are glad your stay was a pleasant one. We hope you come stay with us in the future. Thank you for your review. Please consider us if you come back to New Orleans in the future. decent hotel, needs a bit of updating. Continental breakfast is served daily for a fee. The preferred airport is New Orleans, LA (MSY-Louis Armstrong New Orleans Intl. ): 24-min drive, 16.9 mi/27.1 km. The front desk is open 24 hours a day. Driving? This property offers free nearby parking. No alcohol is served at Olde Town Inn.